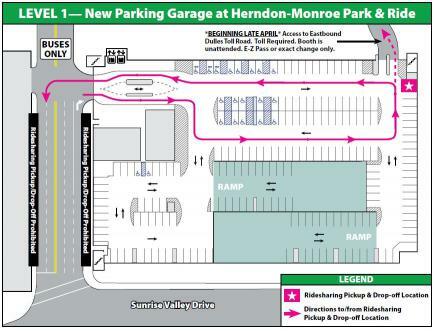 Effective April 8, 2019, sluglines at the existing Herndon – Monroe parking garage will be relocated to the new garage. See the map for traffic pattern. All vehicles entering the garage to pickup slugs should be exiting the garage and muse use Sunrise Valley Drive to access eastbound Dulles Toll Road. Later this month direct access from the garage to Dulles toll road near the sluglines will be opened for traffic. It is not clear when sluglines will have a permanent pickup location along the bus loop. Pay attention to signs, cones, barricades and pavement markings to navigate the new layout. Riders: Turn right to the new garage, riders will be lining behind the yellow bollards nest to the stairs.